‘Tis the season! 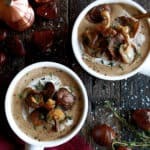 I’m not quite roasting chestnuts by an open fire, but I am making this creamy roasted chestnut soup! 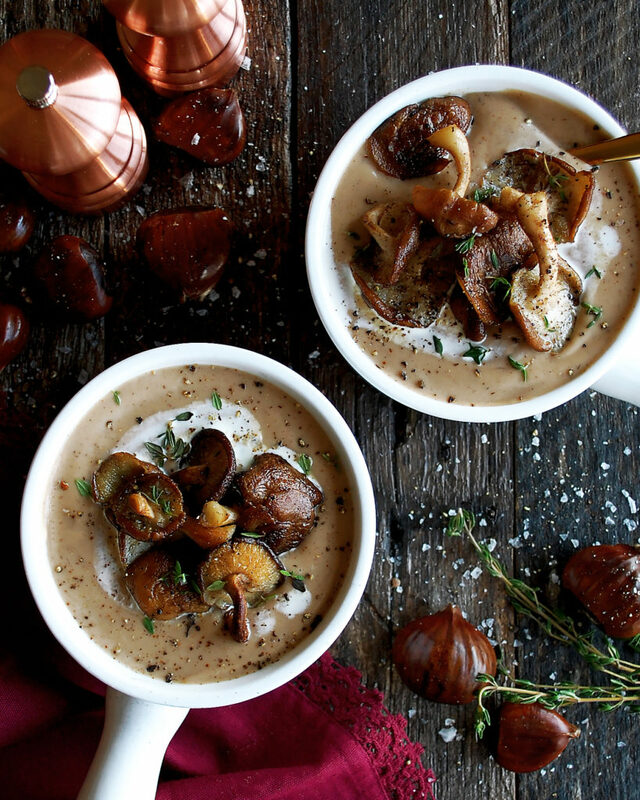 I’m very excited to share this chestnut soup because it just screams Christmas! And I don’t know about you guys, but I am in full swing with all things festive. Christmas is just 10 days away, so I think it’s safe to say everyone’s in the mood for cozy soups, holiday meals, and lots and lots of cookies (like these pistachio shortbread cookie sandwiches). It’s finally getting really cold here, unlike November which was oddly warm. So, a large bowl of soup is definitely in order! 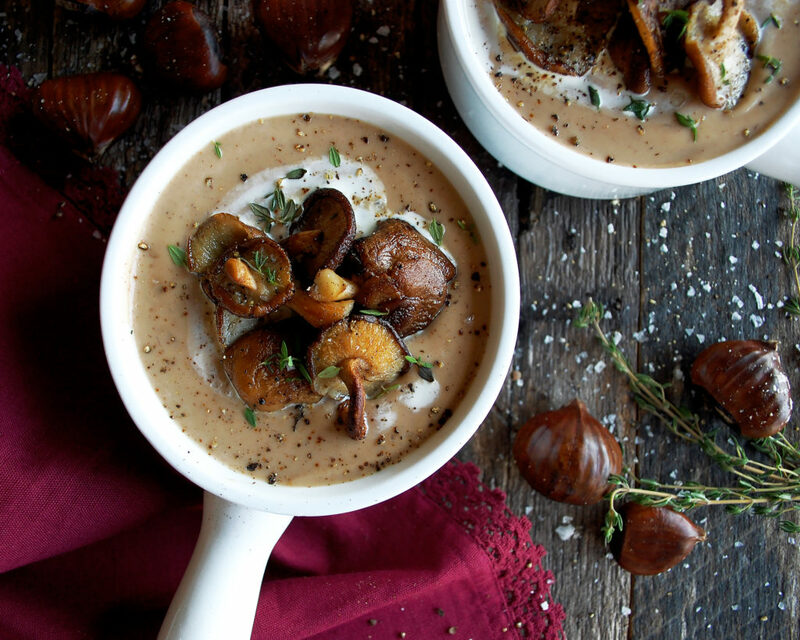 This chestnut soup is creamy, rich, and the perfect thing to eat by the fire on a chilly night. The soup itself is very straightforward and easy to make. 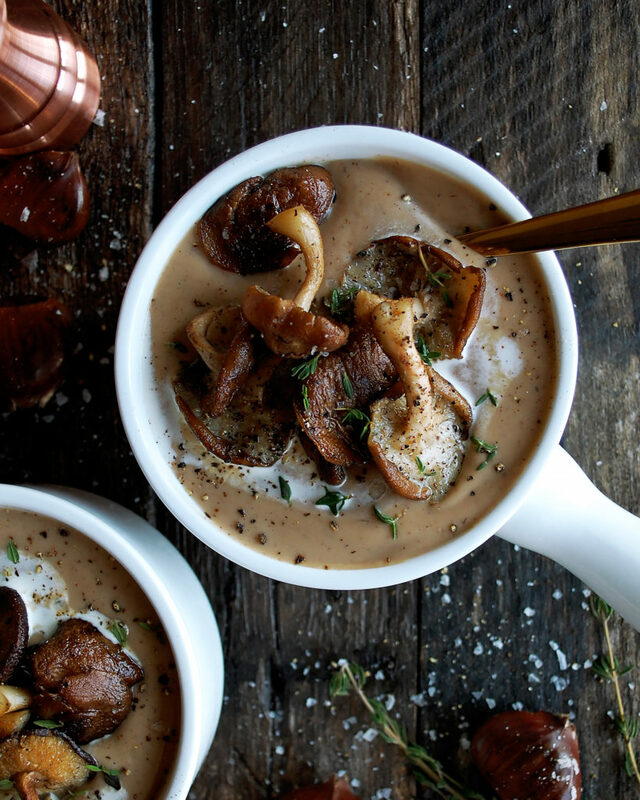 You basically simmer everything together, blend, and then add cream at the end…with some buttery mushrooms for garnish. The thing is, I roasted the chestnuts myself, which may sound intimidating, but I always love doing as much from scratch as possible. I think you can definitely get roasted chestnuts in a jar at Whole Foods (or probably any other grocery store), but I think roasting the chestnuts makes this even more perfect for Christmas time. Here’s a breakdown of what you’ll need to do…. 1. Score the chestnuts by using a small, sharp knife to cut an X onto the round side of each chestnut. 2. Toss with olive oil, coarse salt, freshly cracked black pepper, and fresh thyme leaves. 3. Roast for 30 minutes at 450°F, lowering the heat after 20 minutes to 425°F. 5. Peel the chestnuts when they are still warm. It takes a little bit of time to score each chestnut and peel them, but it’s honestly a pretty simple process. Do be very careful when scoring them, though. Make sure you work carefully so that your knife doesn’t slip. I think I’ll be making this soup again over the weekend, maybe alongside this frisee salad for the perfect lunch! Preheat the oven to 450°F. Use a small, sharp paring knife to score the chestnuts, cutting a small X on the rounded side of the chestnut. Once scored, place the chestnuts in a mixing bowl. Drizzle them with a generous amount of olive oil to coat them well. Strip the leaves off the thyme sprigs into the bowl. Season with salt and black pepper. Toss the chestnuts until fully incorporated. Spread the chestnuts onto a foil-lined baking sheet. Roast the chestnuts, X side up, for 20 minutes. Lower the heat to 425°F and continue to roast for 10 more minutes. Let the chestnuts cool slightly so that they are cool enough to handle, but still warm. Peel the chestnuts, discarding the ones that have turned bad. You will need 8 ounces of peeled chestnuts for the soup. Heat a large, heavy-bottom pot over medium heat. Add the butter and let melt. Add the leeks. Saute for a few minutes until tender. Add the parsnips and chestnuts. Stir to combine. Season with salt and black pepper. Deglaze the pan with the cooking sherry. Cook for about 1 minute. Add the chicken stock and fresh thyme. Bring the soup to a simmer. Cover the pot and let simmer for about 35 minutes. Remove the cover and continue to simmer for 5 more minutes. Remove the thyme sprigs. Working in two batches, ladle the soup into a blender. Blend each batch of soup for 1 minute, or until completely smooth. Pour the soup into a large bowl or another pot. Stir in the cream. Season with salt to taste. Keep warm. Meanwhile heat a large sauté pan over medium-high heat. Add the butter and bring to a sizzle. Add the mushrooms. Saute for about 4-5 minutes until golden and tender. Season with salt to taste. Ladle the soup into bowls. Add a spoonful of mushrooms on top of the soup. Drizzle in a touch of heavy cream. 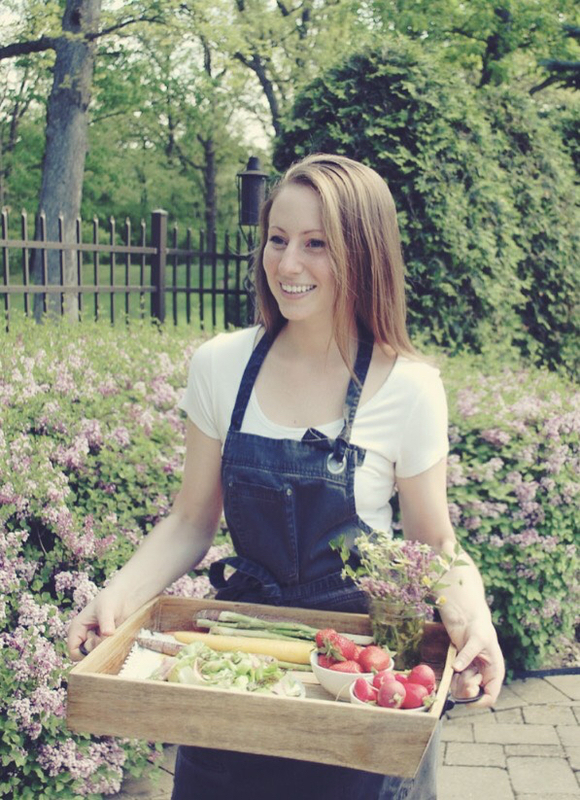 Garnish with fresh thyme leaves and freshly cracked black pepper. Thanks so much Albert!! I really appreciate it. And I completely agree…this would be great all winter long! Stunning photography and beautiful looking recipe. Thank you SO much. I really, really appreciate it!! I made this soup for a neighborhood soup swap party earlier this month. It was a big hit! 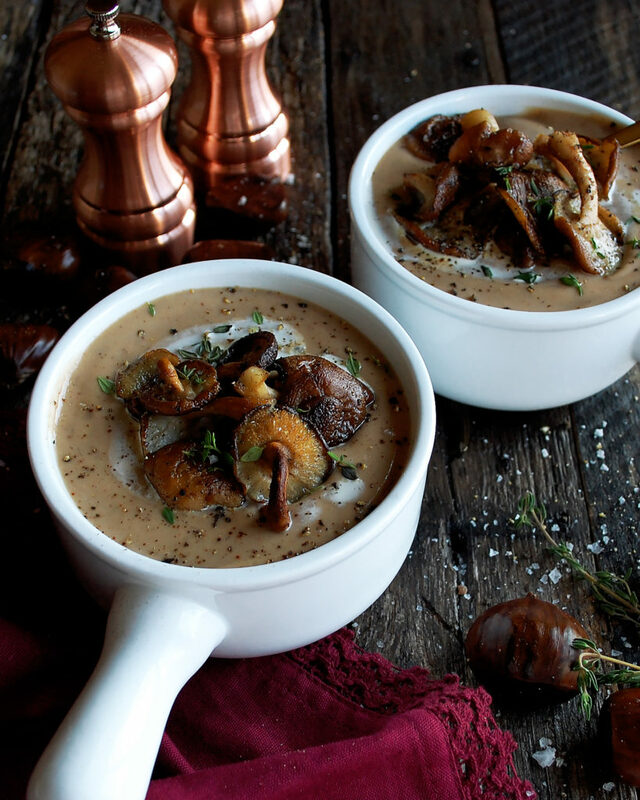 I used local chestnuts and chanterelle mushrooms, I’ll definitely add it to the fall soup menu. Great photography too. Much appreciated. Makes me so happy to hear, Bruce! Thank you so much for the kind feedback, and I’m really glad it was a hit! I bet the chanterelles were beautiful.